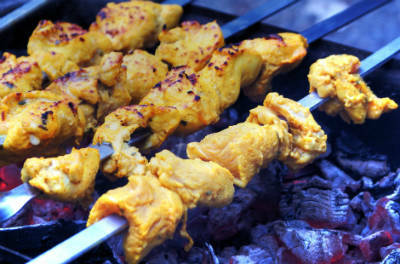 This is the famous Iranian Chicken Kababs with Saffron and Lime. 1. Mix onion, yogurt, olive oil, lime zest, lime juice, garlic, turmeric powder and salt in a bowl. 2. Add saffron strands and mix well. 3. Add red chilli powder and chicken pieces. 4. Mix well and ensure the chicken pieces are evenly coated. 5. Cover with a lid and keep it in the fridge for a minimum of 24 to 36 hours. 6. From time to time stir the bowl. 7. Remove the chicken and discard the marinade. 8. Skewer the chicken pieces. 9. Mix lemon juice and butter in a bowl. 10. Place the skewers on a hot grill and baste with the lemon-butter sauce from time to time. 11. Cook, turning from time to time, till chicken is cooked and tender. 12. Remove and transfer them to a serving plate. 13. Garnish with coriander leaves and squeeze a bit of lemon juice. Feel free to comment or share your thoughts on this Joojeh Kabab Recipe from Awesome Cuisine.